Electrolysis is the process of separating a chemical compound by passing an electrical current through it, either molten or in solution. By applying a voltage across two electrodes immersed in the liquid, an electric field is set up, causing separation of ions in order to maintain electrical equilibrium. For instance, water can be separated into hydrogen from oxygen, with the negatively charged hydroxide ions OH- drawn to the positive electrode and the positively charged hydronium ions H3O+ drawn to the negative electrode. When arriving at the electrodes the ions are discharged and become gaseous oxygen and hydrogen respectively. The net effect of of the migration of ions is identical to the flow of an electric current through the liquid. There are a number of other industrial processes which are based on the same principles. 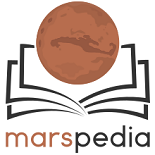 Water is considered a natural resource on Mars. 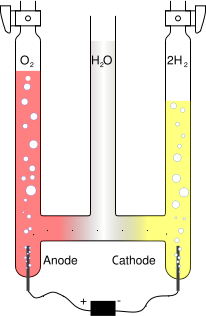 Electrolysis can be used to produce oxygen as part of air in artificial habitats. The produced hydrogen on the other hand can be used for hydrocarbon synthesis, yielding synthetic materials for space suits etc. This page was last edited on 6 April 2019, at 13:07.